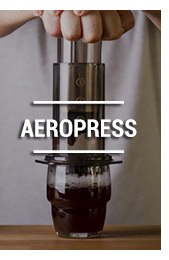 MaxiCoffee helps you discover coffee drippers. 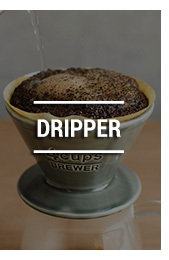 Drippers have become very popular, with booming sales everywhere, thanks to their extraordinary cup shape. also called slow coffee method, coffee drippers will give you a mellow and delicate coffee with a magnificent aromatic power! Borosilicate glass bottle by Hario with stainless steel filter to prepare a delicious cold brewed coffee. Gift idea: ready to go! Like the Murken Hansen design office where it was developed, this QDO dripper is as intuitive as it is practical. This 2-cup filter means you can make a cup of slow coffee and choose the infusion time thanks to the built-in on/off switch. 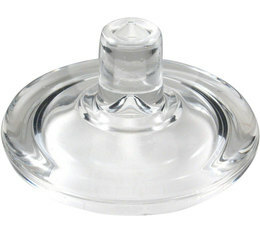 Flat-bottomed double-wall 4-cup Stagg dripper by Fellow. 1X6 Melitta Dripper in clear plastic. 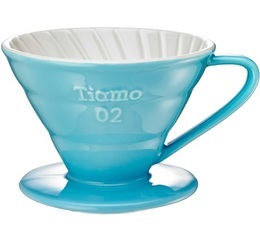 A flat-bottomed porcelain Melitta-type filter to make up to 500ml of coffee (equivalent to 4 cups). 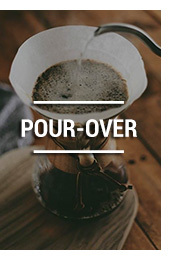 Produces a full-bodied coffee with a light flavour explosion in the mouth. Borosilicate glass bottle by Hario with stainless steel filter, so you can prepare a delicious cold brew coffee. V60 Hario cold brew (iced coffee) coffee jug, capacity 700ml, guarantees a quality cold-brew coffee. The all-glass Kalita IWaki Water Drip Coffee Server offers a quality coffee with exceptional flavours produced thanks to the slow drip process. The Toddy coffee maker uses the cold brew extraction method. Cold brewing reveals all the flavours of the coffee, yet without the acidity.